← Blind and Pregnant? A production company is looking for you. An earlier blogpost called, “Surviving vs. Living,” ended with me challenging myself and challenging others not to just do what you can, but to do what you are afraid that you can’t. The person who is the best at challenging me is my husband. This year we celebrate seven years of marriage and ten years of happiness. To him, just being good enough isn’t enough. He is continuously striving to learn, evolve, grow, and perfect all aspects of himself, everyone around him, our home, our lives, and our future. Last April, for my 31st birthday he helped me challenge myself and we literally climbed a mountain together. I started the year out with the goal that in order to continue the growth of our marriage, I would start to take more of an interest of things that he enjoys. This was around the same time I discovered the book, “The Happy Wives Club,” by Fawn Weaver. Her words describing a happy marriage brought me to tears in almost every chapter. Each description of a happy marriage tugged at my heart as they reflected how I felt about my own marriage. We’ve always had great communication and I don’t want to sound like I’m bragging, but we are probably the most healthy couple either one of us knows. If you want a thriving garden, you must love it by more than just giving it the basic water and sunshine. You must give love by spending time in the garden tilling and fertilizing the soil, singing and talking to the plants, and picking off the caterpillars leaf by leaf. I chose to compare marriage to a garden because gardening is one of his passions I I’ve just recently begun to love myself. After spraining my ankle in January I was afraid that I wouldn’t be able to give myself my birthday adventure. 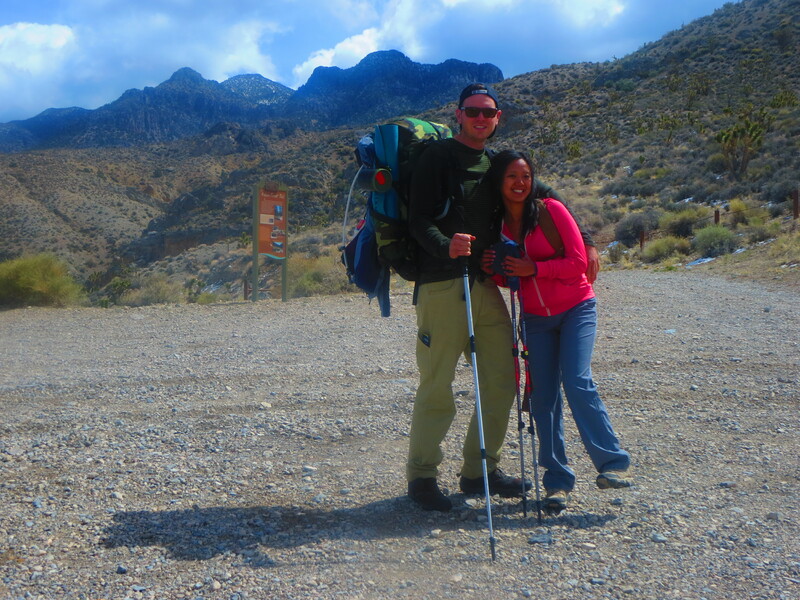 But with his help, I did my first backpacking trip and completed an eleven mile roundtrip hike where we backpacked to an almost century old cabin on the Hidden Forest Trail just outside of North Las Vegas. Last week we started another life changing adventure together. This adventure began with an idea to raise $2,400 in 24 days to help fund his enrollment into a self enrichment leadership program. However, as we wrote out the description for the fundraiser, both of us realized at the exact same moment that it shouldn’t and wouldn’t stop there. This is the beginning of a beautiful chapter in the Rupp family, an adventure full of endless possibilities. an opportunity for us to change our lives and other lives by planting seeds. “Planting seeds,” you ask? Yes. We are planting seeds of inspiration, seeds of love, seeds of adventure, seeds of passion, seeds of possibility, seeds of friendship, seeds of who knows what could be out there. Why? Because everything starts with a seed. This is the beginning of The Seed Project. I would like to ask each and every one of you reading this to please take a minute to watch our video. For more information on The Seed Project or to help us grow by planting your virtual seeds, please visit www.theseedproject.net. Posted on September 3, 2014 by MamaRupp	• This entry was posted in Uncategorized and tagged Adventure, challenge, garden, grow, happy wives club, living, marriage, planting, seeds, surviving, the seed project, virtual. Bookmark the permalink.